Last September, Dustin and I went to Alaska for a fishing trip with his 96 year-old grandfather. We landed in Anchorage and then traveled via prop plane (which if you know about my travel anxiety issues, you know that it took a whole lot of courage to make that trip!) to a tiny fishing camp in the Aleutian Islands. We spent seven quiet days at the fishing camp with one goal in mind: catch salmon. It was honestly the most relaxing seven days. So relaxing that I completely forgot about being in the middle of nowhere and also the fact that I had to climb back on a prop plane and take another five hour ride back to Anchorage. Well, there was the close bear encounter with a mama and her two cubs, but other than that the trip was super relaxing. Anyway, I tell you all this because for the first time ever, while in Alaska, I experienced the deliciousness of fresh salmon. I’m talking about literally catching coho salmon and then cooking that very same salmon over a fire, on the sandy shore, just an hour or two later. Talk about farm to table, or river to table in this case. We were able to bring home 25lbs of salmon, which we slowly rationed out over 2018. We no longer have Alaskan salmon from our trip in the freezer, so my salmon-making has significantly slowed down. Okay, more like come to a complete halt. That is, until Chardea introduced me to today’s delicious and easy-to-make sheet pan salmon meal. Chardea works with me part-time here at Live Simply. 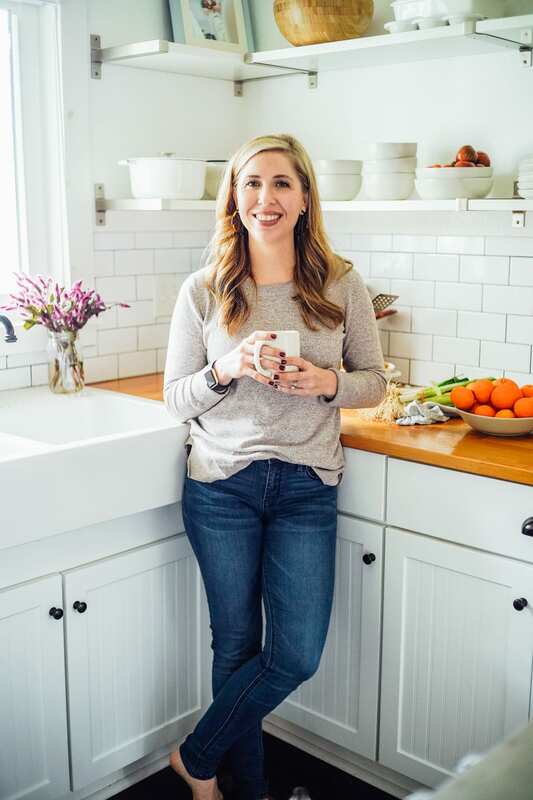 She’s a mom, wife, and lover of good food. 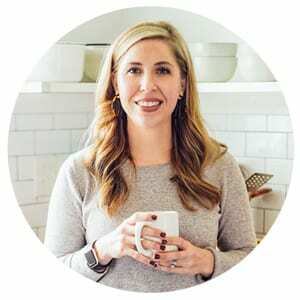 She works in-office with me twice a week, testing out recipes, helping with photography projects, and now helping with Facebook. 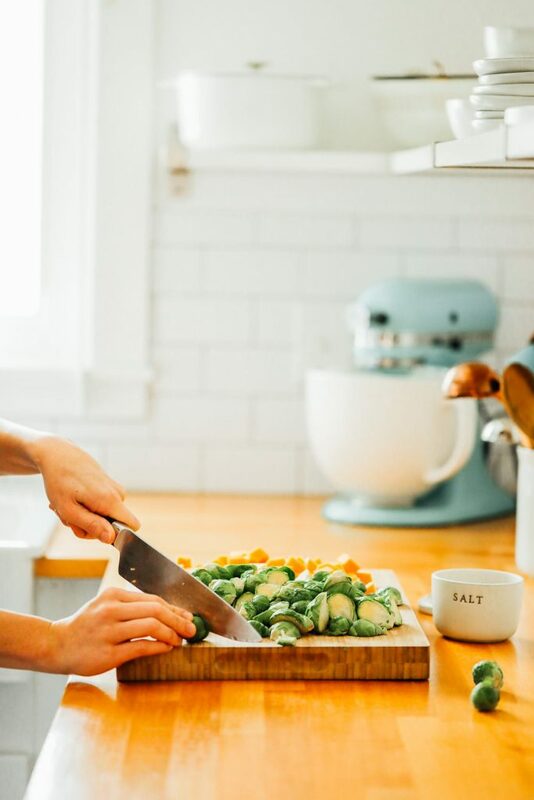 A few months ago, she told me about a sheet pan meal that she makes regularly for her family, particularly when Brussels sprouts and butternut squash are in season. She sent me the recipe on a Friday evening and I knew exactly where to turn for salmon on Saturday morning. Trader Joe’s and Costco are my favorite sources for salmon. Both stores offer frozen wild-caught salmon, which if defrosted properly (remove it from the vacuum-sealed bag and let it defrost on a plate in the fridge) tastes almost as good as the fresh fish we had in Alaska. I made a special trip to Trader Joe’s on Saturday morning to pick up some frozen salmon and made this sheet pan meal for dinner that night. My family loved it. 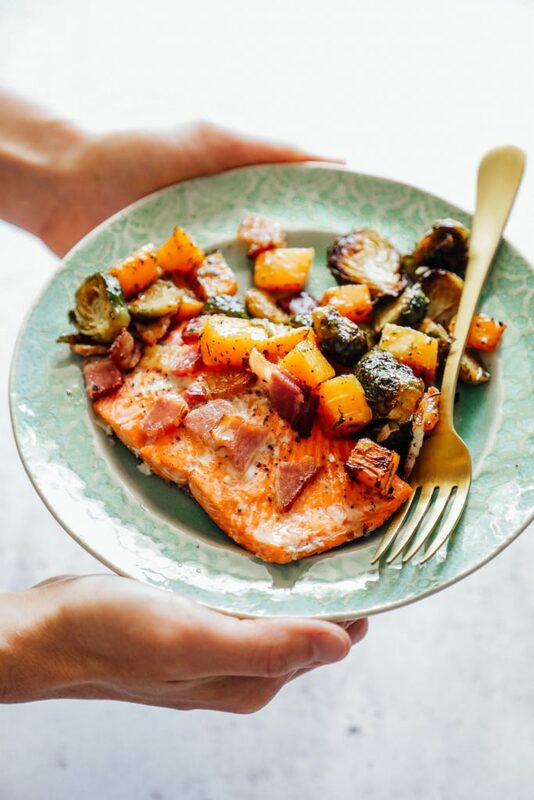 The smokiness of the bacon pairs perfectly with the veggies and simple honey drizzle. And it all works so well with the salmon filets. First, if you’re opposed to using bacon in this dish, or you just don’t have any bacon available, you can skip it. If you do this, I would drizzle olive oil over the salmon filets before roasting/baking. Also, realize that you’re missing out on some major flavor by skipping the bacon. Just sayin’. Remember, bacon is simply a cured meat, which in the past was (and still is) a wonderful way to preserve meat. Opt for a bacon that’s been cured with real ingredients (for example: salt) and from a company you feel confident purchasing from. Also, I think the bacon makes the fish appealing to everyone, even people who don’t particularly love fish. Cheese and bacon have a way of doing that to any food ;). It also helps with adding appeal to Brussels sprouts. Second, the recipe calls for herbs de provence. This is an herb blend that’s made by combining thyme, rosemary, basil, parsley, oregano, tarragon, marjoram, and lavender flowers. I use Simply Organic or Frontier brand. There are a number of brands that make and sell this blend. Typically we stay away from using speciality products in recipes. While this ingredient qualifies as more of a specialty herb blend, I think it’s a great addition to your spice cabinet because it can be used beyond today’s sheet pan meal. 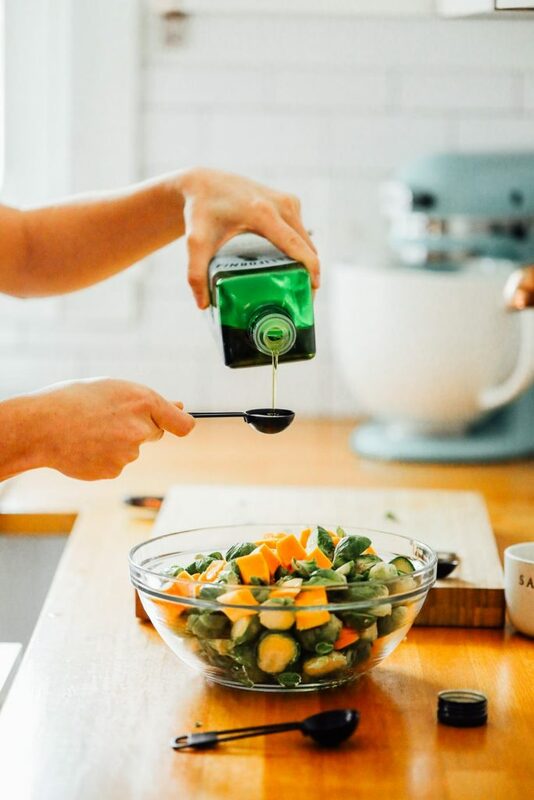 I love adding this herb blend to homemade vinaigrette–try it with a splash of Dijon mustard and honey– and sprinkled over roasted veggies and meats. It’s a great capsule pantry spice to have on hand. 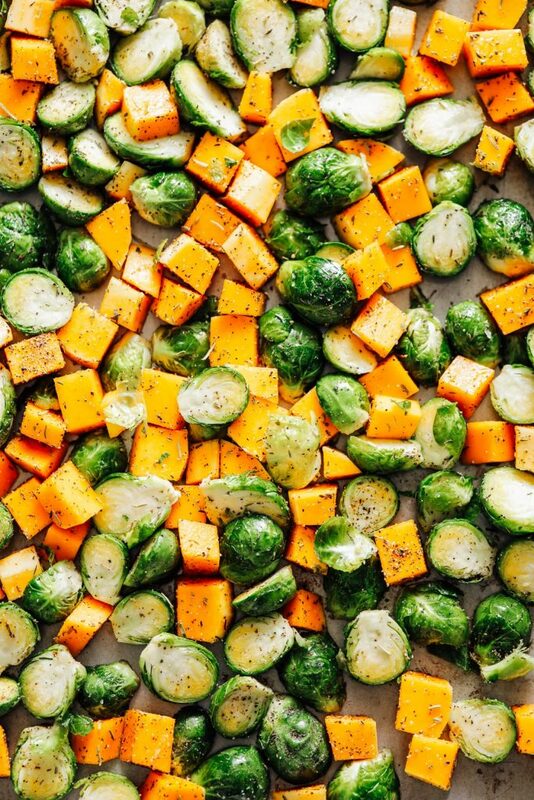 Finally, this recipe calls for butternut squash and Brussels sprouts, but it’s easy to change up the veggies based on the season. I think sliced leeks and white potatoes would be lovely, or try all sweet potatoes. Maybe even try radishes? There are quite a few veggies (think hard veggies) that would work well here. Use the recipe as a guide and change up the veggies when desired. 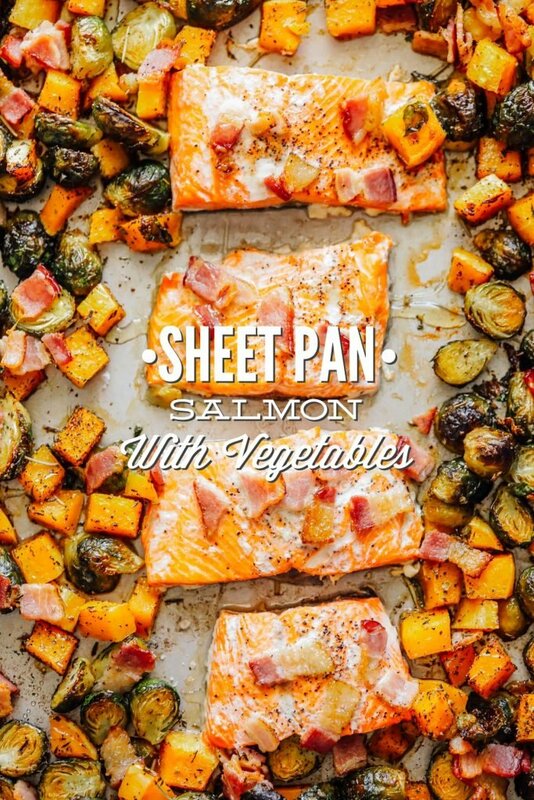 An easy-to-make sheet pan meal featuring salmon, bacon, and vegetables. See the notes (above) for other veggie options and also a variation without bacon. Preheat the oven to 425F. 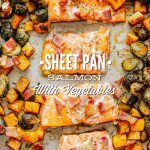 Line the sheet pan with parchment paper. This is optional, but helps make clean up easier. 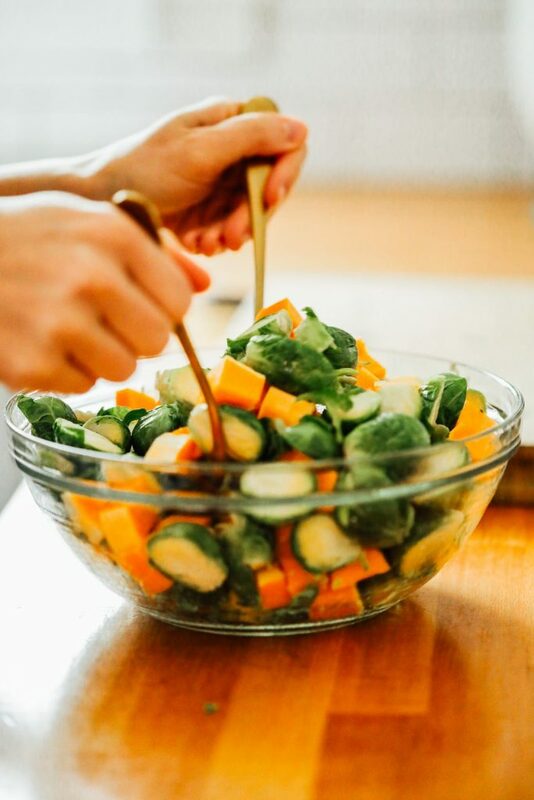 Peel the butternut squash, remove the seeds, and cut the squash into 1-inch cubes. 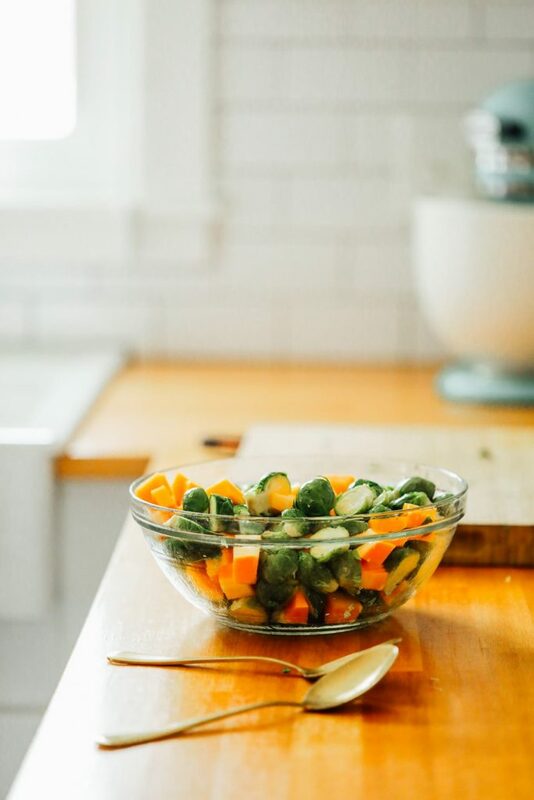 Place the veggies in a large bowl and sprinkle with all the seasonings: salt, herbs de provence, and pepper. Toss the veggies with the seasonings. Pour the olive oil over the veggies and toss again. 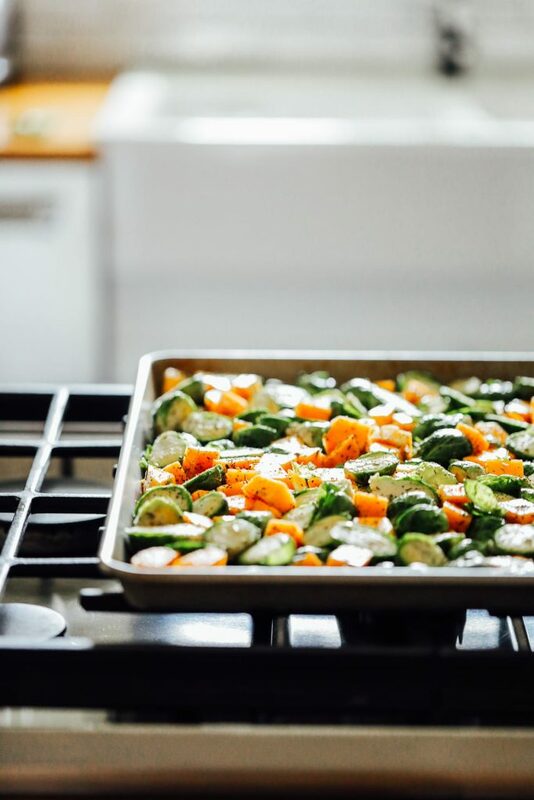 Spread the veggies on a large sheet pan. Roast the veggies for 20 minutes. 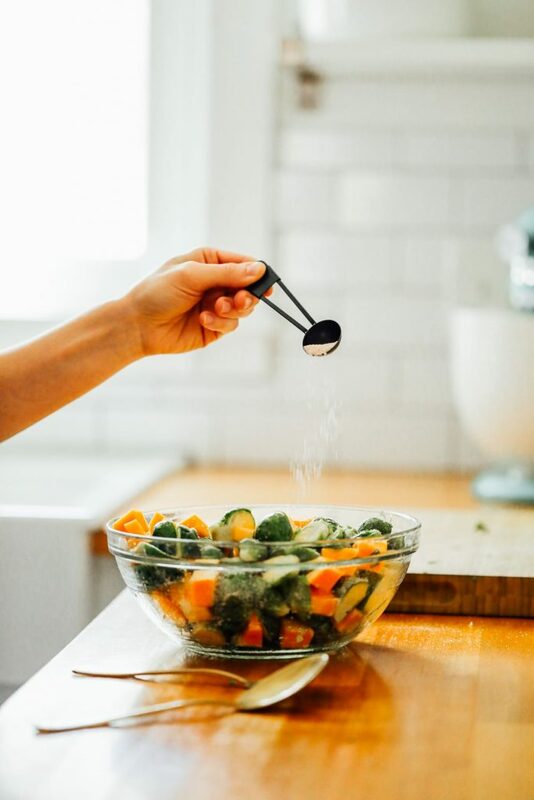 After 20 minutes, remove the sheet pan from the oven and use a spatula or wooden spoon to push the veggies to the perimeter of the pan. Add the salmon filets to the center of the pan. Sprinkle some of the bacon over the salmon filets and sprinkle with salt and pepper (not too much, just a few pinches over each filet). Scatter the remaining pieces of bacon throughout the veggie mixture. 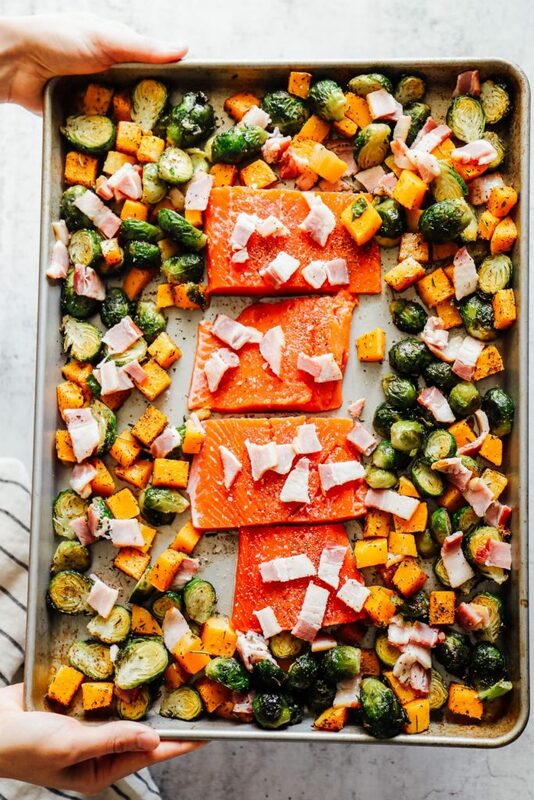 Return the sheet pan to the oven and bake for another 18-20 minutes, or until the salmon is cooked through (it will be flaky) and the bacon is slightly crispy. <--The crispiness of your bacon will depend on the thickness of the slices. I find Applegate bacon works well. 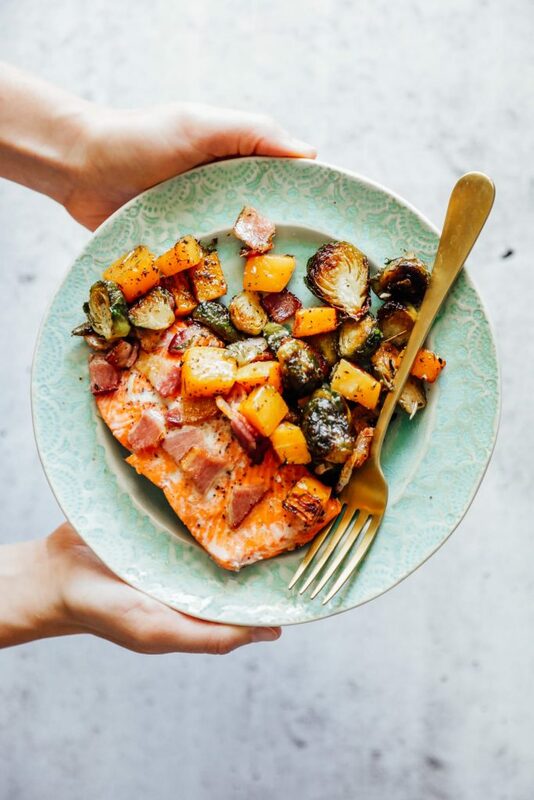 Remove the sheet pan from the oven and drizzle the honey over the top of the salmon and veggies. Serve warm. *Bacon can vary in saltiness, so if you know your bacon is on the saltier side, I would decrease the amount of salt used to 1 or 1 1/2 teaspoons. You can always add more salt later. It's always best to add less salt in the beginning and add more if needed. **This is a "speciality" herb blend that's made by combining thyme, rosemary, basil, parsley, oregano, tarragon, marjoram, and lavender flowers. I use Simply Organic or Frontier brand. There are a number of brands that make and sell this blend. While this ingredient qualifies as more a specialty herb blend, I think it's a great addition to your spice cabinet because it can be used beyond today's recipe. I love adding this herb blend to homemade vinaigrette--try it with a splash of Dijon mustard and honey-- and sprinkled over roasted veggies and meats. If you don't have herbs de provence or can't find it, try using 1 tsp thyme and 1 teaspoon crushed rosemary.